The City of Menlo Park welcomes Rich Struckman to the position of police commander in the Police Department. He will begin his assignment November 13, 2018, and will oversee the Patrol Division. Commander Struckman was raised in San Francisco and is a longtime resident of San Mateo County. He began his life in public service in 1984, when he joined the United States Army. In 1990, he was hired by the San Francisco Police Department where he served with distinction for 27 years. During a very rewarding career in San Francisco, he served at the ranks of officer, inspector, sergeant, lieutenant and captain. He retired from San Francisco in June 2017. Commander Struckman had a very diverse work history with the San Francisco Police Department, which included commanding the narcotics division, serving as a Federal Task Force Agent with the Drug Enforcement Administration (DEA) and US Customs Service, working as a labor representative, teaching at the police academy and participating in the San Francisco Police Youth Fishing Program. Throughout his career, he enjoyed several patrol and investigative assignments. He served as a commissioned officer at several command assignments in the patrol, investigations and administrative services bureaus. 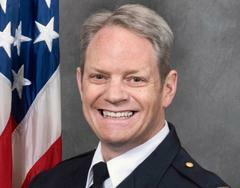 He finished his career as the commanding officer of the staff services division where he served as the department’s chief personnel officer. “We are very fortunate to have Rich join our team. His breadth of experience will benefit the Police Department and he will be a great addition to our command staff,” said Chief Dave Bertini. Rich earned his associate degree in liberal arts from City College of San Francisco, a bachelor’s degree in law enforcement management from San Francisco State University, and a master’s degree in organizational leadership from Saint Mary’s College of California. He is a graduate of the Police Executive Research Forum (PERF) Senior Management Institute for Police along with Leadership San Francisco, class of 2017. When Rich is not at work, he enjoys spending time with his family, walking his dog and hiking and biking on the San Mateo County coast.